In my last post I mentioned my braid maintenance routine but realized that I hadn’t posted it so it was my mission to get this Easy Braid Maintenance Routine out to you. I call this easy because it’s literally using two products and your satin scarf to maintain frizz-free and well moisturized braids. Using the technique featured in the video, I’ve been able to prolong the life of my braids. On a weekly basis, I like to use the Carol’s Daughter Black Vanilla Leave-In Conditioner to moisturize, give shine and seal in my oil. My oil of choice is the Be KeKoa Tamanu Oil that I mentioned in my July Favorites Video, My Ride Or Die Hair Tools for Braids and now in this maintenance post. It’s been my go-to to keep my hair looking and feeling good. During the week, if my hair is feeling dry, I will use the Carol’s Daughter Leave-In to refresh my braids and give that extra shine. The process is super simple, but kept my hair frizz free for almost 3 months. This routine has helped during the take down of the braids. My hair was so soft and manageable during the take down process. I had very little shedding and detangling was a breeze. I’m 100% sure that my weekly routine helped to ensure my hair was healthy and well taken care of. 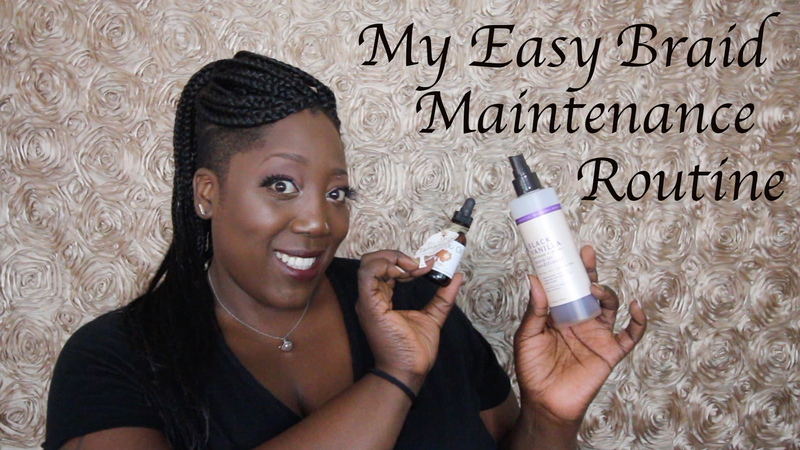 Keeping my routine easy and using only a couple of key products formulated for dry hair has been the best way for me to have healthy moisturized hair. What products are your favorites for your braid routine? 6 Easy Steps for a Healthy Blow Out!